Click here to open the scanned version. Here is my article that came out today in The Clarion Ledger. The article is called "Health Law Repeal Would Toss Out Baby with Bathwater." You can open a scanned Adobe PDF version of the article by clicking here or by clicking on the link below the photo. In the “Pledge to America,” some Republicans call for repeal of the Affordable Care Act. If you want to amend the act, that is one thing, but outright repeal will hurt my family and many others. People need to know what is good in the act so that we don’t throw out the baby with the bathwater. If Republicans want my vote, they need to differentiate what is right on target in the bill and what is worth reconsidering. There are at least six ways the healthcare act has already benefited my daughter tremendously. I’ll give just two examples. * In 2007, my daughter Helen was born and suffered a stroke. This happens to one in six thousand children. Just one of our many, many bills was for $100,000, which charged only for her stay in the hospital for her first month of life. That did not include doctors’ visits, medicines, tests, the helicopter flight to the specialist hospital, etc. The $1,000,000 lifetime cap on benefits that my insurance plan imposed per beneficiary might sound great to the inexperienced reader, but it can run out very quickly. Were we to run out, my wife and I would certainly sell everything we have, go into bankruptcy, and get on Medicaid. I would do what I have to do to save my little girl. The healthcare bill made this unnecessary. I can sleep better at night. My daughter will have coverage as long as I pay my premiums and as long as she needs care. My insurance company can no longer cap benefits in the way that it did, in a blanket fashion for each person. A simple call for repealing healthcare does not tell me whether those advocates will defend my daughter or return us to the frightening system we had before. Repeal of the healthcare act is no solution. The answer: talk of amending the act, not of repealing it. Let’s keep the baby and lose the bathwater. * A second crucial element of the act concerns pre-existing conditions. How many Americans want insurance companies to be able to deny children coverage because of pre-existing conditions? My daughter didn’t give herself an ailment. She suffered a brain infarction at birth. That is precisely why she needs coverage, yet this was reason people in the past would try to deny support. That is simply outrageous, a moral bankruptcy. So long as the Democrats alone defend this measure, they will have many people’s votes. Repeal is not the answer. Keep this measure. Amend the act where needed – don’t repeal it. I love the references to the nation's Founders we’ve been hearing lately. We should look more closely, though. My favorite Republican of all time was Ben Franklin. He was a man of compromise. He did not think the Constitution was perfect, quite the opposite. His speech about it was titled “I agree to this Constitution with all its faults”! The Founders knew that they could only move forward with compromise and with plans for how they would in time amend what was wrong while preserving what was right in what they had done. If you want change and if you want votes, tell us exactly what you will change and what you will keep. Outright repeal of the healthcare bill will hurt my family and the families of Democrats, Republicans, and independents all over the country. 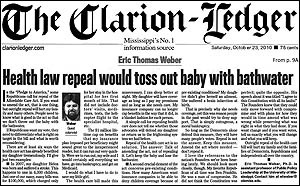 Dr. Eric Thomas Weber is assistant professor of Public Policy Leadership at the University of Mississippi, expressing only his own point of view in this article. His second book, Morality, Leadership, and Public Policy, will be released in 2011 and his third book, Democracy and Leadership, is in progress. Visit EricThomasWeber.org.